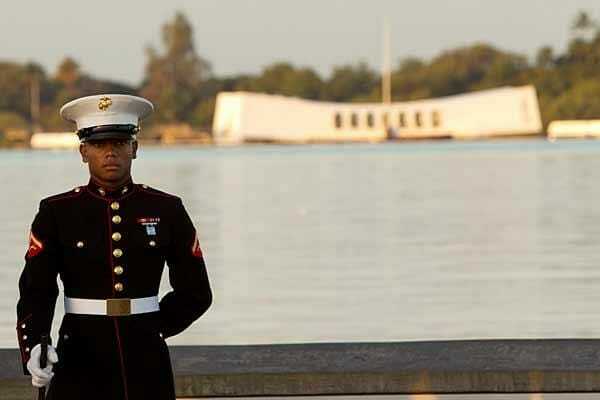 A US Marine stands at attention with the USS Arizona memorial in the background on Pearl Harbor Day, the 69th anniversary of December 7, 1941. Today is the 71st anniversary of the Japanese attack on Pearl Harbor. A day when more than 3,500 Americans were killed or wounded and the U.S. naval fleet was almost completely destroyed. It was a devastating day in our history and the event that officially drew America into WWII. Just before 8 on the morning of December 7, 1941, hundreds of Japanese fighter planes attacked the American naval base at Pearl Harbor near Honolulu, Hawaii. The barrage lasted just two hours, but it was devastating: The Japanese managed to destroy nearly 20 American naval vessels, including eight enormous battleships, and almost 200 airplanes. More than 2,000 Americans soldiers and sailors died in the attack, and another 1,000 were wounded. The day after the assault, President Franklin D. Roosevelt asked Congress to declare war on Japan; Congress approved his declaration with just one dissenting vote. Three days later, Japanese allies Germany and Italy also declared war on the United States, and again Congress reciprocated. More than two years into the conflict, America had finally joined World War II. Elizabeth McIntosh, a reporter for the Honolulu Star Bulletin, wrote an account of what she witnessed that day and the days that followed. But, her story was deemed too graphic for publication. Over 70 years later, McIntosh’s story has been published. It’s extraordinary. Read the rest of Elizabeth McIntosh’s story here. God bless the brave Americans who sacrificed so much to protect our country. And those who continue to do so today.